A lighter is a handy tool, often underestimated while providing a variety of uses. The ability to summon fire at the flick of a finger may seem like childs play to us, but think how many thousands of years it took us to get to the stage where that is possible on demand. Lighters have evolved with the times, starting with the liquid butane and old flint spark models. Today, there are rechargeable versions that are more convenient, fun to use, and eco-friendly. The best plasma lighter is something entirely different though. These things are brilliant. 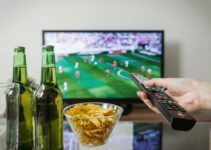 What Makes A Plasma Lighter Different? A plasma lighter produces a high voltage between at least two electrodes creating an electric arc between them. The air between them is ionized making it much hotter than a flame. They do not require harsh chemicals or gas. The benefit of a plasma lighter is that you never have to worry about the wind blowing out your flame. Plasma lighters are windproof and water-resistant in small amounts. These lighters are the most convenient as they never have to be refilled with fuel. 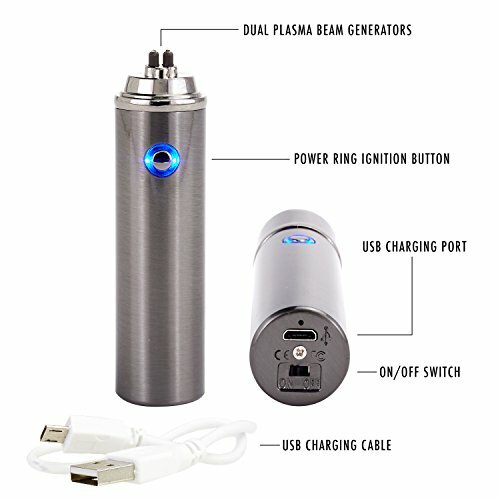 Plasma lighters can be charged by using a USB cord from your computer or electrical outlet. Ralix plasma lighters are one of the most popular on the market. It has a simple design and wider set arc space that work best to heat larger items. The power button is on the front of the lighter making it feel like you’re holding a remote. 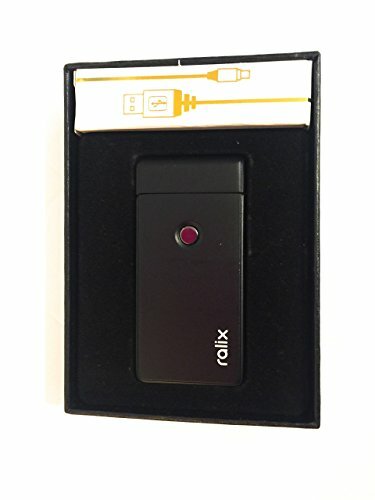 The Ralix Electronic Lighter can fully charge within in an hour and comes with its own USB charging cord. This plasma lighter will provide you with 300 lights off of one charge. It is effective, wind-resistant and safe. It is made of zinc alloy that will never fall apart or melt. This lighter gets the job done and is excellent for the price. The matte finish design looks very nice and is a great idea for a gift. The Saberlight Electric Sparq Lighter comes in a cylinder shape ideal for lighting candles, bowls, pipes, and larger surface areas. This lighter has a dual arc that sits off the tip of the end. The safety cap flips to the side staying out of the way of the flame. You will find the power button conveniently placed at the top. The charging port and on/off switch are located on the bottom of the lighter. The Saberlight is made from stainless steel and has a blue area that illuminates around the power button. This plasma lighter can provide 300 lights when the battery is fully charged. It comes in a stylish gift box with a USB charger. The Saberlight Electric Sparq Lighter is more expensive than its competitors but worth the price. This is extremely powerful, efficient, and highly portable. Novelty Wares’ Dual-Arc Plasma Lighter has a smooth body and smaller size making it a perfect replacement for your current flip-top lighter. This lighter comes in 6 varieties of vibrant colors. The power button is found on the sides of the lighter just like a butane version. It has a standard flip-top design and is made of materials that are corrosion resistant. The plasma lighter offers 300 lights after two hours of charging time. It comes with a USB charging cord that has a status light letting you know when it’s charged. 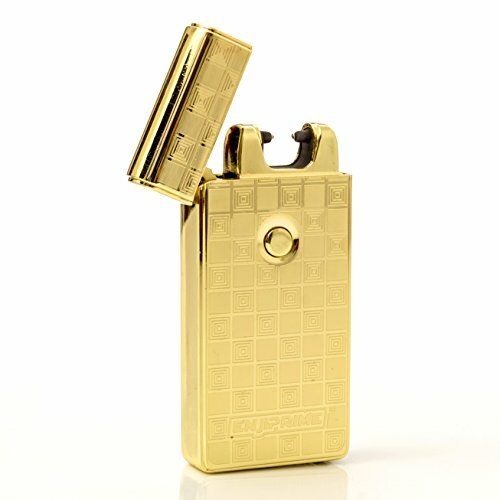 Enji Prime created this plasma lighter that is splash proof, rechargeable, eco-friendly, windproof, and energy savings. It comes in impressive packaging with a high-quality money clip. A single one hour charge can produce 300 lights. The elegant design and matte finish make it a great gift for family or friends. The safety lid keeps your lighter secure and prevents accidental damage. Enji Prime offers a 30-day money back guarantee on this plasmatic lighter. The TriGear Elite Series Lighter is one of the best single arc models with a convenient size and shape. The lighter is smooth, small, and flat and can fit easily into your pants pocket. Even though it is a single arc, the mechanism has a wider space that can easily light campfires, cigars, and more. The flip-top lid secures the lighter making it completely safe when not in use. It comes with a USB cord and a soft carrying sack for protection. A one to two-hour charge can produce up to 300 lights. 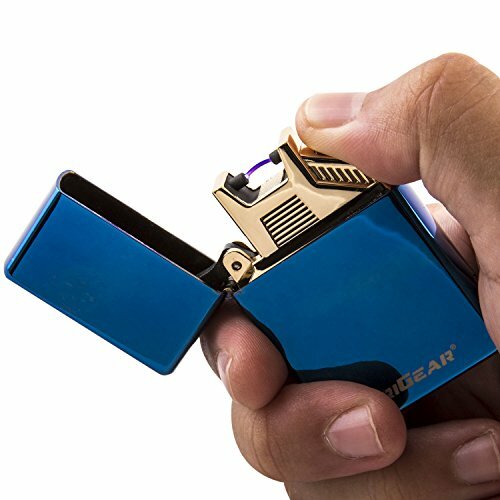 This plasma lighter is truly unique due to its single arc appearance but dual arc design. The stainless steel and black color scheme are appealing to most people. 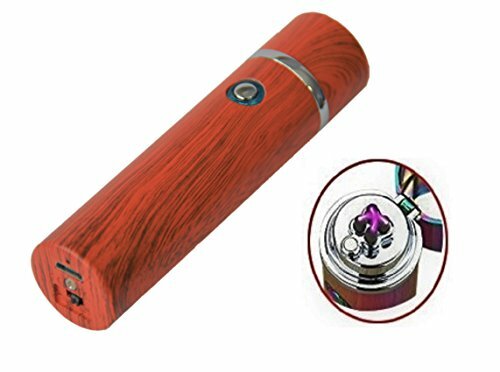 The flip top style prevents the BOLT Electric Arc Lighter from activating when the lid is closed. The two bolts sit alongside each other compared to most plasma lighters that have criss-cross arcs. This particular design increases the lighting area and makes it easier to use in complex situations. Many plasma lighter users find the criss-cross design difficult at times. This lighter is a perfect alternative and is one of the best on this list. 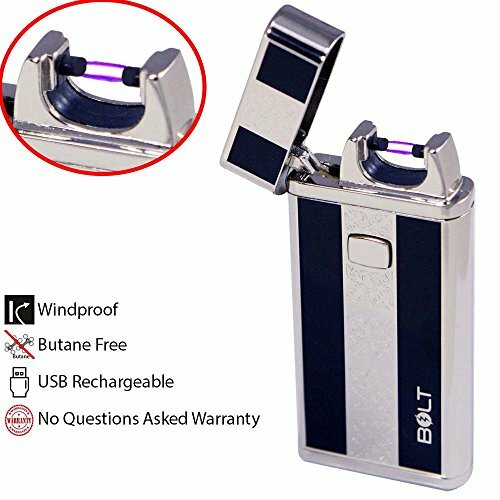 The BOLT lighter comes with a USB charging cable with an indicator light letting you know when it’s done. The Mantello USB Plasma Arc Lighter is futuristic looking when it comes to its overall look and design. 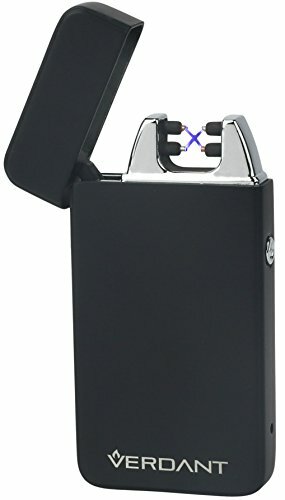 Instead of the usual flip top lid, this plasma lighter folds back with the single arc mechanism located in the middle. The power button is conveniently located an inch below the arc. The lid’s safety feature is built in preventing the arc from igniting when the lid is closed. It comes with a USB charger and a soft carrying case to prevent damage. The Atomic Lighter by BulbHead is a windproof, rechargeable electric lighter. It comes in a sleek black design with Lightning Bolt Technology that helps light your object quickly using strong electric arcs. This particular model has a safety feature that stops the current from running when you hold the power button for more than eight seconds. It is made with a rugged black metal casing that provides a non-slip grip. It is flame, flint, and fuel-free. 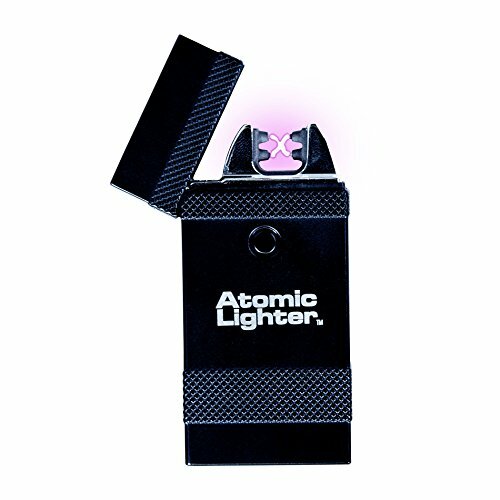 Since there is no flame, your Atomic Lighter will work on a windy day or in the rain. This lighter works great for BBQs, bonfires, candles, and fireworks. This is a flameless, windproof and safe plasma lighter that requires no fluid or gas. 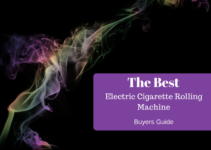 It works with a touch of a button making it convenient and faster than your standard lighter. The USB charging cord is compatible with the Android charging line. The arc is a cross shape and is resistant to high temperatures making it safe and long-lasting. 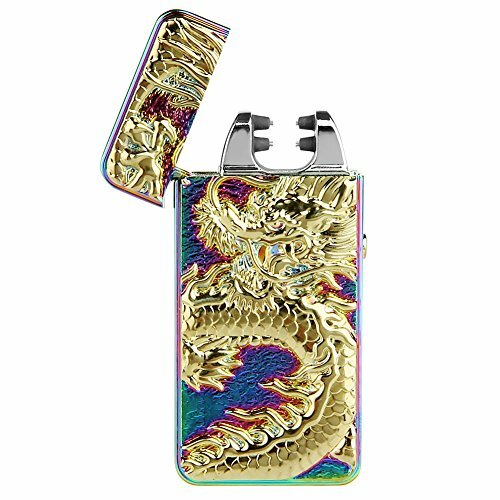 The three-dimensional relief dragon design makes this a fashionable plasma lighter compared to its competitors. One press of a button creates a flameless electric double arc. This lighter can create 300 lights after two to three hours of charging time. It is windproof and can work under any weather condition. The Pard plasma lighter is TSA approved and will not light up when the lid is closed. 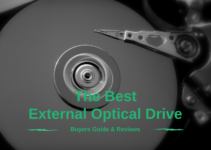 Before investing in a plasma lighter, there are some things you should consider. The most important factor should be its durability. Plasma lighters that are made from a strong housing such as zinc will help prevent it from scratches or breaking easily if dropped. Plasma lighters that are cheaply made will result in you spending more money for another product. Another important factor is how long it will take for a full charge. 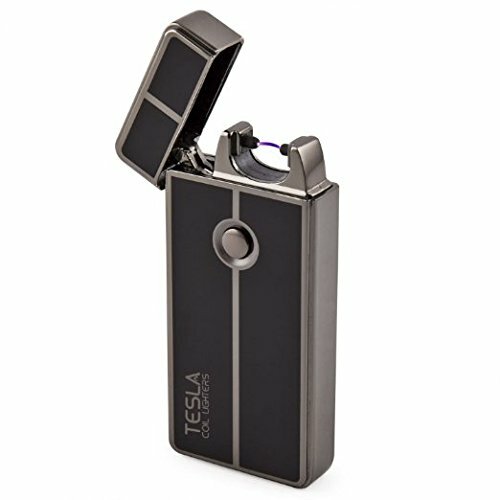 Individuals that use a lighter often such as smokers might require a plasma lighter that can charge quicker. The ideal electric lighter should take no longer than one hour to fully charge. Finally, the price is an important thing to consider. Expensive lighters that come with several bells and whistles doesn’t necessarily mean it is a good model. The type of model you choose should depend on how you intend on using it. When using your new lighter, keep it away from your body, clothing, and face. Do not use it in direct sunlight for long periods of time, and keep away from children.